This wand is a unique item crafted for advanced crystal therapists or anyone recovering from a severe heartbreak. It is made from a natural rough ruby of approximately 15 carats, a star ruby, and a kyanite cabochon. Ruby purifies feelings of love, causing a person to think in terms of the “big picture”. It is difficult for a loving person to shut down their feelings, so it is better to help those feelings to mature into unselfishness and letting go. Kyanite helps in this as well by helping one to feel more peaceful. I’ve found in my work that it helps people to think more clearly. This wand was made in pendant form for portability, to keep the stones from rolling away, and so that it can be worn as a necklace, or as a waist level charm. I would recommend that one wear this as a necklace during the initial phases of a heartbreak, and then later when things are calmer, carry it in the pocket or wear it hanging from the belt. 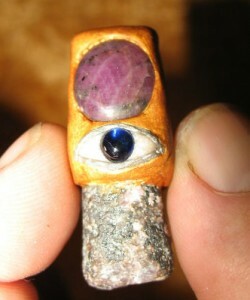 This is another wand made with a natural rough ruby and a star ruby, but this time with a garnet accent stone. It is crafted for general emotional healing, but does especially well with helping people to refresh their passion. Sometimes when people suffer from depression or melancholy or take certain medications, things in life lose their luster. This can be disastrous if the person is an artist or doing some important work for which passion and a high degree of motivation and ferocity is crucial. 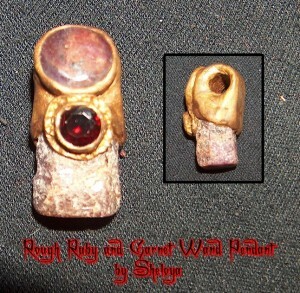 Ruby and garnet used in combination helps people to recover their fire. crystal, emotional healing, emotional pain, heartbreak, kyanite, peace, recovery, ruby, therapy, wand. Bookmark.